“Thus will I accomplish My wrath on the wall and on those who have plastered it with untempered mortar; and I will say to you, ‘The wall is no more, nor those who plastered it, that is, the prophets of Israel who prophesy concerning Jerusalem, and who see visions of peace for her when there is no peace,’ ” says the Lord GOD. Words out of our own heads building lies like poor mortar builds a wall that is not able to do what a wall is built to do because it is weak. The forces of nature come against that wall and it falls; the paint and cover up do not hide the weakness. The words are not able to do what they are intended to do because they do not come with the power of God. How do we know when the spoken word is not of God? We know because we know the Lord. We are immersed in his word, his voice is familiar to us, we have his Spirit to bring to remembrance and give understanding. His Spirit bears witness with our spirit and we connect when the word is from him. Words that are not of God but come from our own imaginations are like the inferior mortar and the ideas the words are building will fall apart, they cannot support what they intended to support. The wall of words falls down. The false prophets spoke peace when there was no peace. Does what we hear live up to the scrutiny of the whole word of God? Therefore, all that is spoken of within the context of Christendom is not necessarily of the Lord. The warning is given and we can take heed. We can see to it that we know the Word of the Lord. It has been said that those who are trained to spot counterfeit dollars study the real dollar. We know what is false because we know what is true. Thank you, Faithrises for nominating me for this award and the help in getting it posted. I’m new to this. I am honored and thankful, but if there is any credit it truly rests with the Lord. I do my best to be faithful to His leading and that is the reason for my blog. What is shared there is in direct relation to what I receive from him. It is my prayer that it blesses, encourages and inspires others as His word does me. I must confess that receiving comments and acknowledgements is encouraging for me as well. I concur that we are ‘the body’ and we must be about lifting one another up through edifying and encouraging. That said Faithrises is a delightful inspiration and can be followed at http://faithrises.com/author/faithrises/. The next step is to say seven things about myself. I am on a life search for Christ, I have found him and wish to know him better. I am married, mother of blended family of four children and four grandchildren. I am retired from public school teaching which for me was a ministry as I responded to a call on my life. I am mobile with my last move taking me to the southland. I enjoy gardening, writing, reading, painting, in essence, creating. That would make me a child of my Father! 3) State 7 things about yourself. 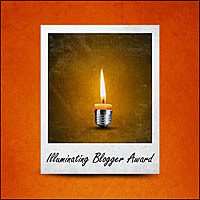 I would like to nominate the following bloggers for this award. They have been an inspiration for me and I trust that will be true for you. And we hear similar conversations today. The warnings are still valid. He responds with affirmation that he is Lord and we will know it. Just a word that these posts are the reflections and words that come to me during the early morning hours in my personal time with the Lord. They are what I receive and apply to my walk with the Lord. They are shared in the hope and belief that they may help encourage and inspire others as well. This is a search for the very nature and being of God. What emerges is the image of one who is powerful and does not sway with the wind as mankind does. There is constancy here, reliability here and there is fearsome judgment from which we have a way of escape. The gift of salvation from the curse of sin through Jesus Christ is freeing in all areas of life. The one who created, loved and continues to love. So should we. Ask yourself the question: What is your purpose? We are charged with spreading, sharing the message of the cross. We “were not commissioned to be God’s policemen.” Like that line. The fourth week of July, 2012 saw some tumultuous division occurring in our country due to one man’s personal views being publicly stated. As usual, I am not reporting from the trenches. I stand on the sidelines observing the two sides going at it with one another. This is how I learn (or in modern techno-lingo, this is how I roll). I have not taken a strong stand in favor of, nor against either side. I did, however, post a comment to one of my virtual friends on FB who appears to be a warrior against anything labeled as conservative. Now the word of the LORD came to me, saying: “Son of man, you dwell in the midst of a rebellious house, which has eyes to see but does not see, and ears to hear but does not hear; for they are a rebellious house. So I did as I was commanded. I brought out my belongings by day, as though going into captivity, and at evening I dug through the wall with my hand. I brought them out at twilight, and I bore them on my shoulder in their sight. And in the morning the word of the LORD came to me, saying, “Son of man, has not the house of Israel, the rebellious house, said to you, ‘What are you doing?’ Say to them, ‘Thus says the Lord GOD: “This burden concerns the prince in Jerusalem and all the house of Israel who are among them.” ’ Say, ‘I am a sign to you. As I have done, so shall it be done to them; they shall be carried away into captivity.’ And the prince who is among them shall bear his belongings on his shoulder at twilight and go out. They shall dig through the wall to carry them out through it. He shall cover his face, so that he cannot see the ground with his eyes. I will also spread My net over him, and he shall be caught in My snare. I will bring him to Babylon, to the land of the Chaldeans; yet he shall not see it, though he shall die there. I will scatter to every wind all who are around him to help him, and all his troops; and I will draw out the sword after them. We have ample evidence of the violence done by those who dwell in these areas and the violence is spreading. We can know him through Christ and rejoice or we can know him outside of Christ and weep. But it is oft stated that we will know that he is Lord. Our take away is this: These may be ancient words but they are still accurate and true for today. Mankind has not changed. Neither has God. His hand of mercy is still extended to all who will ‘see’ and ‘hear’. Let’s be sure to be an object lesson to those around us. Let’s be sure to share Christ so that there may be more who can rejoice and not weep. More and more often I find that tolerance is one-sided. I also find that what Jesus said is very true; “They hate me, they will hate you.” paraphrased. I cannot embed this video, so you have to go to godvine.com to see it – Yes, this is a must. Therefore say, ‘Thus says the Lord GOD: “Although I have cast them far off among the Gentiles, and although I have scattered them among the countries, yet I shall be a little sanctuary for them in the countries where they have gone.” ’ Therefore say, ‘Thus says the Lord GOD: “I will gather you from the peoples, assemble you from the countries where you have been scattered, and I will give you the land of Israel.” ’ And they will go there, and they will take away all its detestable things and all its abominations from there. Then I will give them one heart, and I will put a new spirit within them, and take the stony heart out of their flesh, and give them a heart of flesh, that they may walk in My statutes and keep My judgments and do them; and they shall be My people, and I will be their God. But as for those whose hearts follow the desire for their detestable things and their abominations, I will recompense their deeds on their own heads,” says the Lord GOD. So the cherubim lifted up their wings, with the wheels beside them, and the glory of the God of Israel was high above them. And the glory of the LORD went up from the midst of the city and stood on the mountain, which is on the east side of the city. Then the Spirit took me up and brought me in a vision by the Spirit of God into Chaldea, to those in captivity. And the vision that I had seen went up from me. So I spoke to those in captivity of all the things the LORD had shown me. Ezekiel is obedient to share even though the vision is full of hard words to receive and imagery that could cause some to disbelieve its truth. There are several key elements to note, one of which is the Lord’s statement that he is with his people wherever they are. This is encouraging to hear for it speaks to us today as well. No matter the conditions around us, no matter the turmoil, the stress, the destruction caused by mankind, still our God is with us in all of it. There is a testimony to this truth that is current. It can be read here; So you STILL think God is a merciful God?! This is the written response from a believer who was in the theater in Colorado when the gunman came in and did the shooting. She is writing about her experience from the perspective of one who knows in reality that God is present with us wherever we are. He was her sanctuary and the sanctuary for her daughters. This promise was given to the Israelites who continued to worship the Lord God of Israel and it is also given to the present day believer in Christ. He is our sanctuary, he promises a transformation, he promises unity and new spirit. The promises are as old as time and new every morning. We can take hold of these promises and allow them to be manifest in our lives. God is the same yesterday, today and tomorrow. Count on that.